I am skeptical of the existence of ghosts. Though, I believe in their existence enough so to pursue haunted places for the chance to see one. I believe in them enough so that I feel chills down my spine when I hear a ghost story. There is still so much left unknown, but who am I to tell others that their experiences are imaginary or a trick of the mind. I want to believe, but I want to remain objective. I move along a Mulder and Scully spectrum, where science and first-hand experience can be both strong and weak evidence. This has made my lifelong independent study of ghosts and hauntings much more challenging, exciting, scary, and fun. Recently, I took one of my weekend cemetery strolls through Spring Vale Cemetery (a local favorite of mine). This stroll would be special, because I would be joined by James (founder/lead investigator) and Kevin (researcher/team lead/investigator) from the Wabash Paranormal Research Society. The Wabash Paranormal Research Society is located in Lafayette, IN with a branch location in Kansas. They offer their services free of charge to homes and businesses, taking away the financial burden from an already stressful situation for many people. While many of their clients are in the area, they haven’t turned away those outside of Indiana and Kansas. They sincerely want to help. James said the team started in 2010 when he returned home from the Marine Corps, but he has been active in paranormal investigation since 2001. A visit to Lafayette’s old Pythian Home (an old nursing home) sparked his interest. After seeing things he couldn’t explain at the site, he became a paranormal investigator (and did it even during active duty). James and Kevin expressed a passion for solving paranormal mysteries. Along with offering free services, their team pays for their own (expensive) equipment and for trips to investigate haunted locations. Recently, I learned that locations with a haunted history will open their doors to paranormal investigators…at a cost. Nevertheless, such a business is important for keeping these historical places running. It’s hard to keep history alive in our economy and paranormal investigation helps keep historical structures standing, while sharing the stories of its deceased inhabitants. When you first go into an investigation, you get your base readings. So you take your K2 Meter, you take your Mel Meter, and you measure what the house gives off. So if you go by an electrical socket it’s going to go up. Or if you go by a fan, it’s going to spike up. You’ll go into the kitchen and note the hum of the fridge. You get your baseline audio. You get your baseline reading of the house. So when you start getting evidence above that, you can chalk it up to possible paranormal activity. But you cannot completely prove it, because nothing can be completely proven in this field yet. They also said their years of working as paranormal investigators allows them to recognize familiar domestic noises (such as creaky floors). To also make sure audio data is not misconstrued, they ask all investigators to speak at their regular volumes, since whispers might be mistaken for other sounds (I’d have a problem screaming). I was surprised by the amount of work that goes into analyzing data. For example, they place multiple microphones around a haunted house, one in each necessary room. Each microphone will capture around 8 hours of data. Analyzing, say 5, microphones’ audio is going to take a long time. And, that’s only one of the tools collecting data. Not only do overnight investigations leave a lot of analysis work, but it also takes a physical toll on the body. Both described the dreaded “paranormal hangover,” which is a special level of tiredness one gets when chasing things that go bump in the night. Then there’s the possible risk of malevolent spirits. At one investigation, for example, an investigator got scratched 27 times in a matter of 5 hours. Another notable example happened at Black Moon Manor, where James was physically assaulted. All of the sudden we hear footsteps running down the hallway, scratches on the wall. All of a sudden I feel two hands press down on my chest. And all I know at this point, is that I’m off the ground. And I went right through a chair, a plastic chair. I use an analogy. It’s like going fishing. You cast your bobber out there and you can be out there for days until you get a bite. So. you don’t always find activity. There will be nights where there is completely nothing. There will be nights where there is the best evidence I’ve ever seen in my life. And on any show you watch, you see an hour of data, but they’ve been out there for 4 days. So they are showing you the evidence they caught over a span of maybe 4 days. And, that’s why it seems like they are catching a lot. Then you have some shows where the crew goes in before and sets up EMF pumps, so it’s pumping the air full of electromagnetic waves. So naturally you have a better chance of catching evidence. Understandably, homeowners may be discouraged if an investigation produces little or no evidence. Kevin and James explain to their clients that their investigation was only one night, and they are willing to come back again. I don’t know what I was expecting when I entered Spring Vale that day. Maybe those ghost hunters that are adrenaline junkies? But, I was surprised to meet two paranormal investigators that genuinely care for improving the lives of scared and confused families. I’m glad our community has this resource. 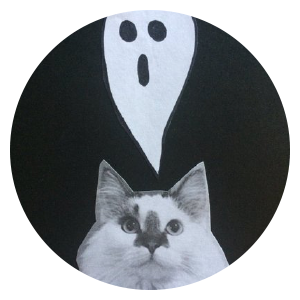 While I may be skeptical of the existence of ghosts, James and Kevin pointed out a phenomenon I’ve noticed since starting the blog. Oftentimes, people are quick to dismiss ghosts, but once you start talking to them about the possibility, they eventually reveal interesting first-hand experiences and family stories. And, like James and Kevin, I want to hear those stories. Hopefully one day, I’ll see my first ghost. And if it messes with me, I’ll give Wabash Paranormal Research Society a call. Make sure to checkout their website (be careful, it screams) and Facebook page.